Posted October 1, 2018 by SJ Eye & filed under SJ Eye News. 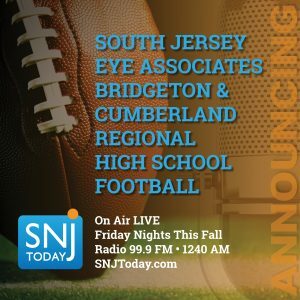 (September 2018) This fall, South Jersey Eye Associates is proud to present High School Football on SNJ Today Radio, featuring the Bridgeton Bulldogs and the Cumberland Regional Colts. The dedicated staff, Dr. Michael A Feinstein (alumnus of Bridgeton High School), and Dr. Brandon J. Wuzzardo (alumnus of Cumberland Regional High School) show no favoritism…but do enjoy a bit of friendly rivalry.